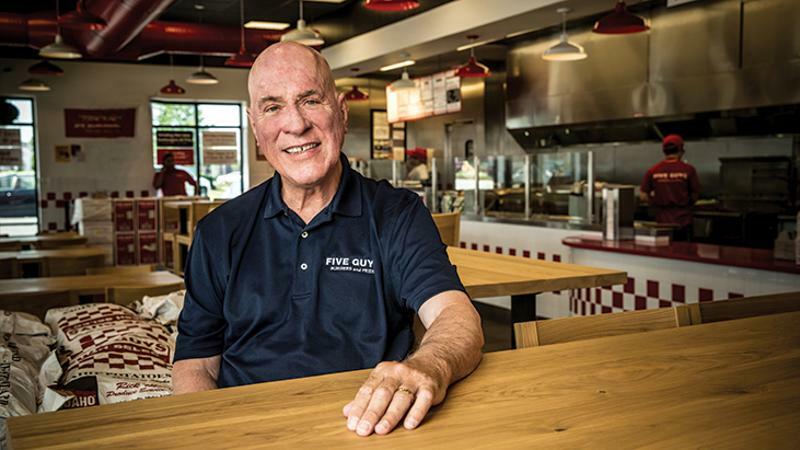 Jerry Murrell was too convulsed with laughter to answer the question: Had he made any memorable mistakes in the early days of Five Guys Burgers and Fries? “You’re kidding, right?” responds the 71-year-old, who says he founded the Lorton, Va.-based retro burger chain with his wife in 1988 to give his five sons—Jim, Chad, Ben, Matt and Tyler—something to do. Whatever blunders he and the family might have committed in those early days soon were pushed into memory by the phenomenal success of Five Guys. It became a David in a market of such Goliaths as McDonald’s, Burger King and Wendy’s. And it signaled to the industry that consumers were looking for something better to eat on the go, even if that meant paying more and waiting longer. Many regard it as the godfather of the fast-casual segment. The reception from guests and franchise prospects landed the chain in the No. 1 spot on Restaurant Business’ inaugural Future 50 ranking of emerging chains in 2006, and it has continued to chug forward in the 10 years since. But that upswing was not a constant, as Murrell recounts in a style that dispels any doubt about his commitment to the second of his two founding principles: Remain true, and have fun in the process. People did come, but the line took a while to build, Murrell acknowledges. Word-of-mouth eventually made a hit of the first Five Guys, and expansion followed, albeit at a glacial pace initially. The fledgling company opened five stores in 15 years, all of them run by the Murrells. That pace was OK with the paterfamilias. He wasn’t intending to create an empire, just a business strong enough to support his family. As a financial planner who specialized in helping families transfer their wealth to the next generation, he knew his boys weren’t going to be on “easy street” living off Dad. Even if the clan wanted to expand faster, the financing wasn’t available to do it. “The banks didn’t want to have anything to do with us,” Murrell says. Then his eldest son came home with the book, “Franchising for Dummies,” co-authored by Wendy’s founder Dave Thomas. The switch to franchising was like firing a starter’s pistol. The store count climbed exponentially, with deals for 300 stores signed in the first 18 months. Today, it’s far past the 1,000-unit mark. Success didn’t spare the Murrells from the strife that often afflicts family businesses. “I remember pulling up one time to a store opening and seeing two of my sons fighting outside with a broom and a mop,” says Murrell. The tension was eased by a stroke of luck. “Each of the boys seemed to be interested in a different aspect of the business, so that’s where they tended to gravitate—one to operations, one to public relations,” and so on, he says. That steadfastness figured into the menu. The Murrells insisted on quality ingredients, and they were transparent with customers about the origins of what they served long before it became a trend. Being true also meant forgoing quick-service conventions, such as advertising and promotions. “I like to be contrary,” Murrell says. Instead of a marketing budget, the chain has a pot of money that it uses to reward crew members whom managers identify as fulfilling their jobs 100 percent. It’s a bonus-as-regular-compensation program. No one is more important in pleasing the guest, Murrell stresses. He remains engaged in day-to-day domestic operations, “probably more so than I’ve been in a long time,” he says. He makes a facetious reference to getting ready for a stock offering, something often suggested—usually by people outside the chain—in the wake of Shake Shack’s post-IPO valuation of almost $3 billion. With nearly three decades of restaurant experience under their peaked caps, do the younger Murrells still readily accept Dad’s input? “My sons have always listened to everything their father says and done whatever he wants,” says Murrell. Then he bursts into a belly laugh. Are there things he does that rile them? “I’d say about everything,” he jokes.